Colin Kaepernick is a contentious figure in American football because of the protests he started against the US national anthem. While other protesting players remain on teams and play, Kaepernick remains unsigned despite what some say is a talent above other players. And as the American football season just began, this article from the Washington Post caught my attention. Some of the arguments I have seen for Kaepernick’s unsigned status allege he just is not very good. But is that so? What does the data show? Well thankfully the Post dived into that and is running what we can best call a Kaepernick tracker comparing him to qualified quarterbacks in the NFL. It turns out, he is a middle-of-the-pack quarterback, demonstrably better than half-a-dozen and sitting solidly amongst an almost third-tier or cluster of players. The data clearly shows that poor performance is not the reason for remaining unsigned, otherwise he would have replaced any number of quarterbacks. True, it could come down to his dollar cost, but most likely his remaining unsigned, compared to almost a dozen players underperforming him, is related to his protests. Now from the design standpoint, I also wanted to call attention to this article because of the way it handles definitions. The article uses the statistic adjusted net yards per attempt to assess performance. But what does that actually mean? Well, in the digital margins of the piece, the designers include an explanation of that statistic. I thought this was a really well-done part of the article, not interrupting the main narrative flow for a definition that a portion of the audience probably knows. But the more casual followers or people more interested in the political nature of the story would have no idea, and this does a great job of explaining it to us laymen. Credit for the piece goes to Reuben Fischer-Baum, Neil Greenberg, and Mike Hume. The joke I have been telling everyone in person this past week: I changed jobs and moved 750 miles from Chicago to Philadelphia, but I still cannot escape the NFL Draft. The two previous drafts occurred across the street from my last job and this year they are three blocks away from my new flat. Traffic is a bloody nightmare. So while there is a lot of news to cover through data visualisation and design, the local story is the NFL Draft that begins tonight next to the Rocky statue and in front of the Art Museum. We will return to trade wars with Canada, tax cuts for the rich, North Korea, climate change, and other things over the next few weeks. Today’s piece comes from the Washington Post and looks at NFL Draft success across the NFL. Unfortunately for all of you, I know almost nothing about the NFL except Free Tom Brady. (I have to transfer my Red Sox allegiance somewhere, right?) But this set of small multiples looks fantastic and generally tells me that the Colts and Packers—the latter likely to the chagrin of my Chicago-born followers—have historically done well. Aesthetically, I am not sure about the handwriting typeface. I wonder: could the content have been handled better by a more traditional face? As most of you know, I am a huge baseball fan. I am not so much a huge fan of American football. But I will watch it from time to time. And as a Red Sox fan, that means I will root for the Patriots. So I guess you know how my Sunday night went. But this past week, I started my subscription to the printed New York Times. 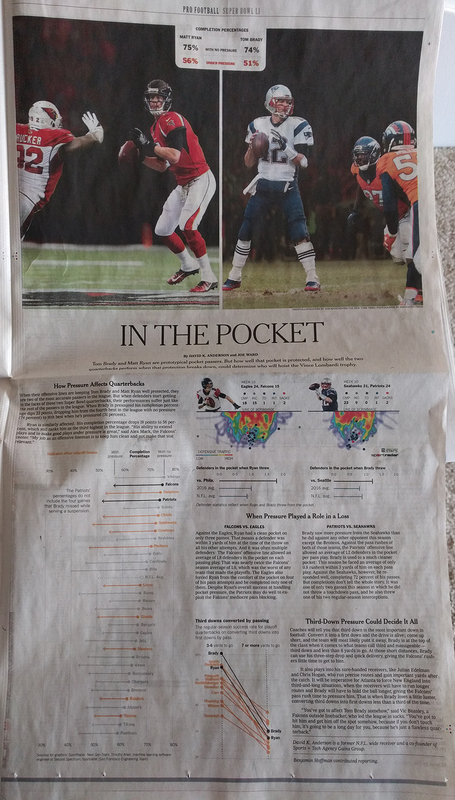 And on Sunday I opened the sports section to this full-page graphic. It comprises three graphics: The big one on the left looks at completions under pressure. Despite being a full-colour page, the designers only needed two colours to convey the message—black and orange. Similarly, on the right, the third-down graphic also uses a more limited palette. But, for the heat map it does make some sense to use a full colour palette. Overall, the page shows that colour, when thoughtfully restrained, makes not just the graphic clearer, but also good sense. Credit fort he piece goes to David K. Anderson and Joe Ward. Well, we have arrived at 2017. We all know the big political story in the executive branch. But we also saw elections in the legislative branch. But how different will the 115th Congress look from the 114th? The Wall Street Journal took a look at that in an article. The article’s graphic does a nice job showing the two different compositions. But if we are truly interested in the growth, we could use a line chart to better showcase the data. So what did I do last night? I made that chart. But as I was playing with the data I saw some numbers that stood out for me. So I compared the proportion of minorities in the original graphic to their proportion of the US national population, per Census Bureau data. The line charts, broken out into the House vs. the Senate and then into the two parties, do a really good job of showing how the growth is not equally distributed between the two parties. 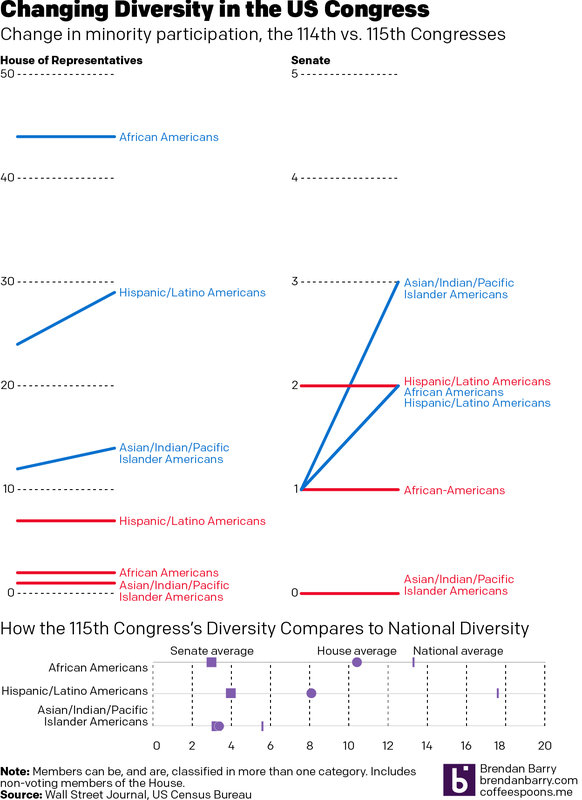 And the reverse of that is that it shows how one party has failed to diversify between the two congresses. 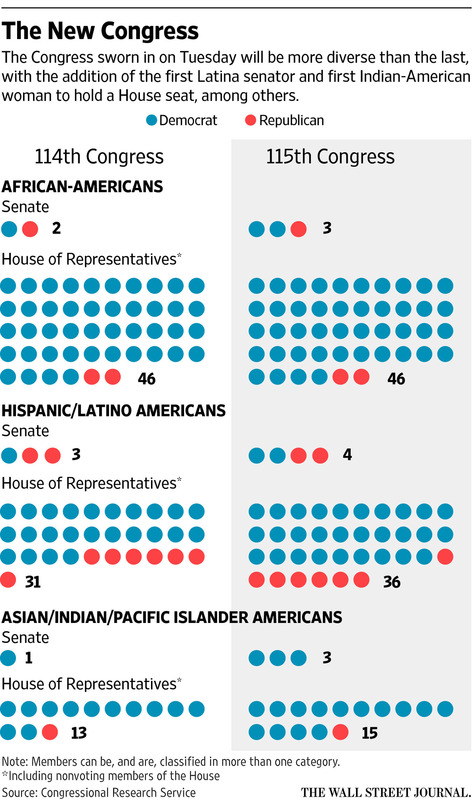 The 115th Congress might be more diverse than ever. But it has a long way to go. 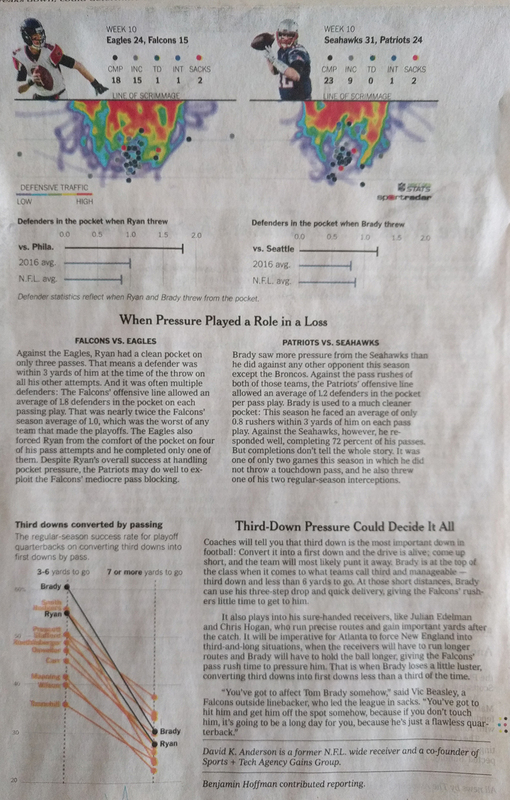 Credit for the original piece goes to the Wall Street Journal graphics department. In US presidential politics, the common sense truth is that candidates run to the wings of the parties to get primary voters. They say ridiculous, inane things, but with the hope to walk them back later. Why? Because while they commonly run to the outsides edges during primary season, candidates recognise that in the election itself, victory comes from the moderates. 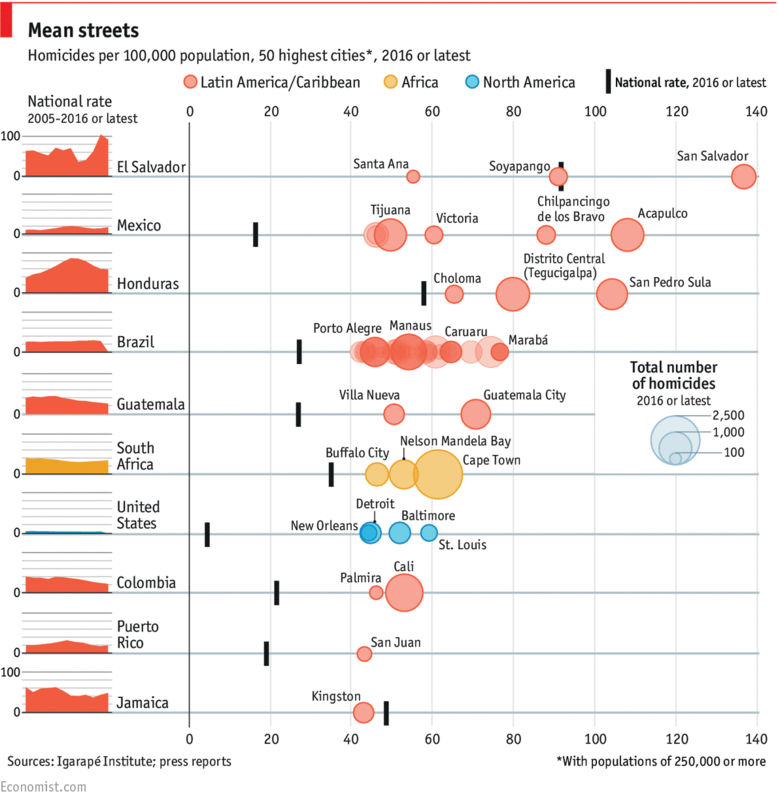 And yesterday, the Economist published a really nice piece on this point. 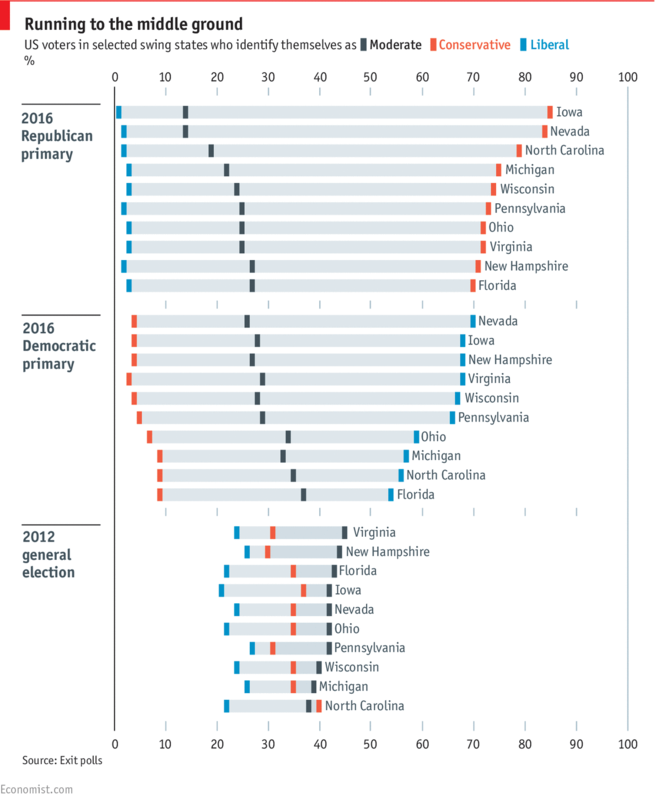 For a sample of battleground states, the Economist examined who voted in the recent primaries versus who voted in the last general election. Given the aforementioned common thinking, not surprisingly self-identified Democrats voted in droves for the Democratic primaries. And self-identified Republicans voted in the Republican primaries. When one looks at the historical 2012 data, however, with the exception (barely) of North Carolina, moderates out voted Democrats and Republicans in all the battleground states. 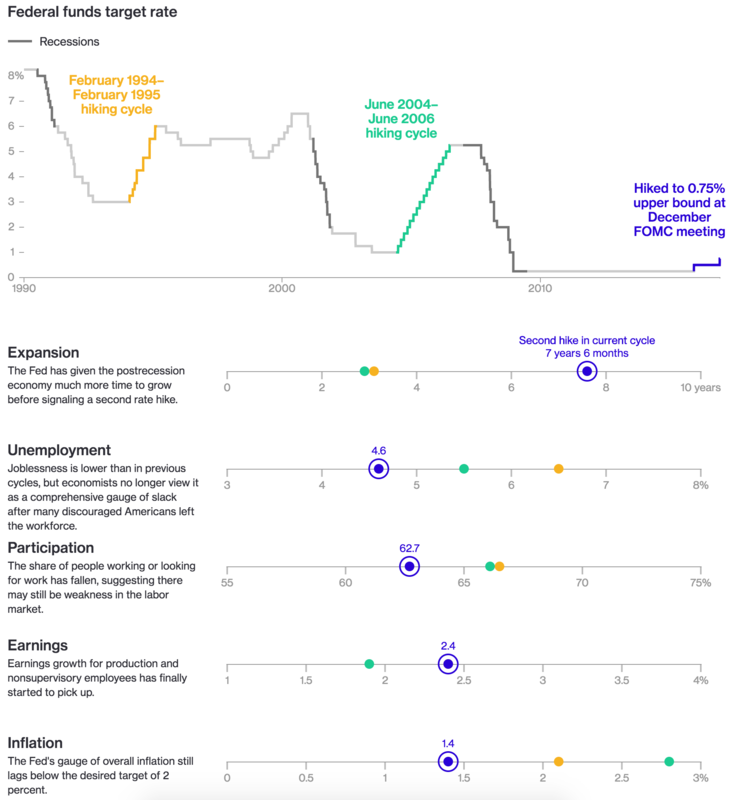 Not every chart needs to show revolutionary data. 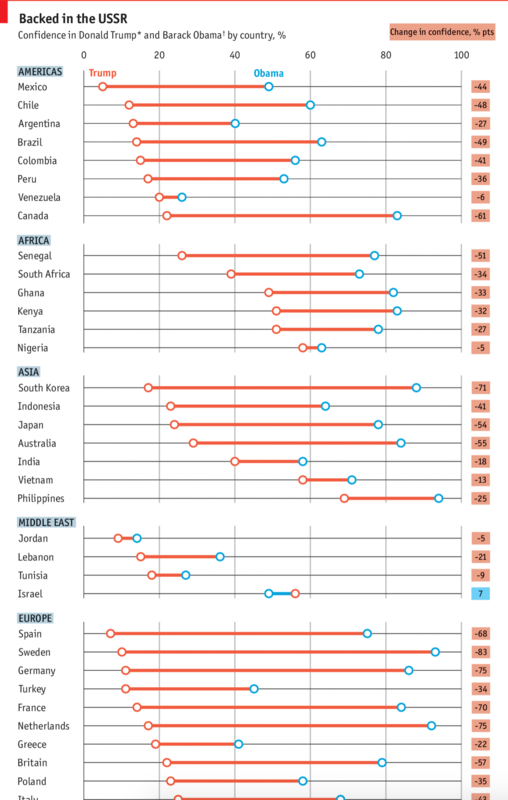 Sometimes data can simply validate widely-held truths that people know without knowing the data and facts behind them. And that is what this piece from the Economist does. So the basketball finals begin tonight with the Cleveland Cavaliers taking on the Golden State Warriors. This is also the part of the post where I fully admit I know almost nothing about basketball. I did, however, catch this so-labelled infographic from ESPN contrasting the two teams. 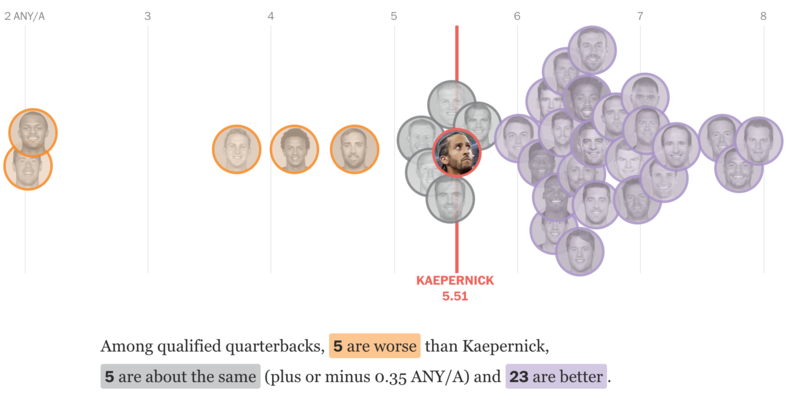 What I appreciate at this piece is that ESPN labelled it an infographics. 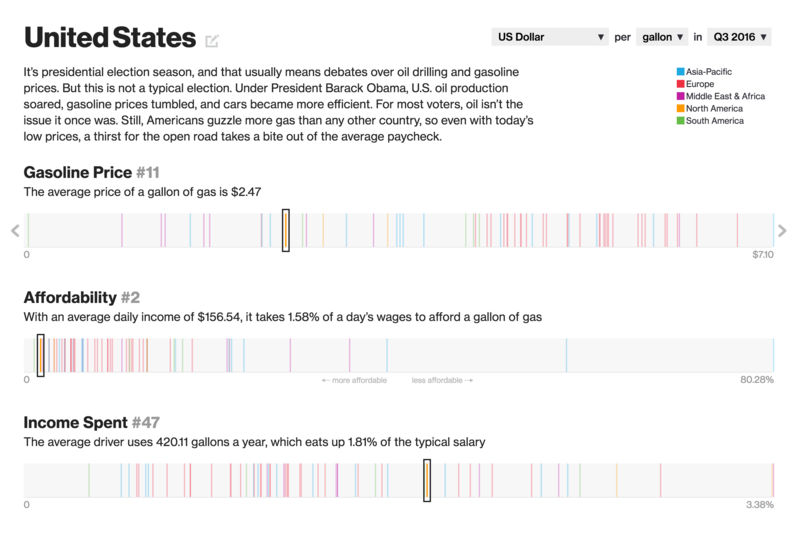 And while the data might be at times light, this is more a data-rich experience than most infographics these days. Additionally the design degrades fairly nicely as your browser reduces in size. 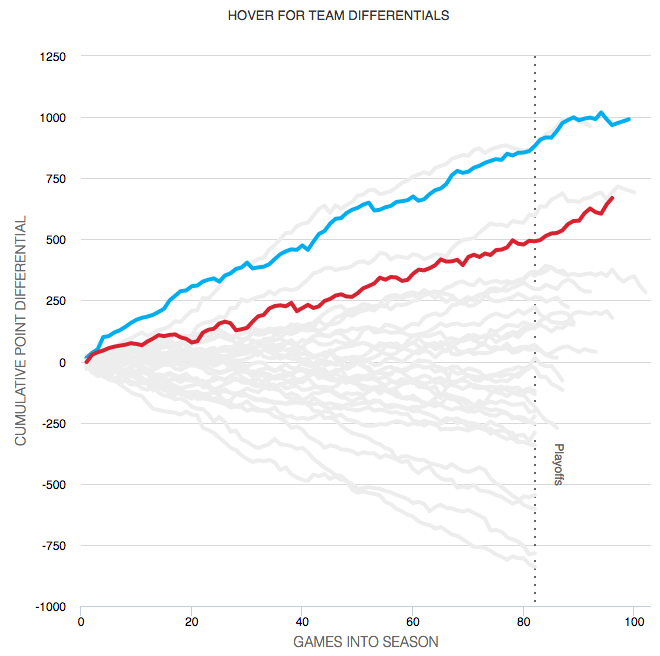 The chart formats themselves are not too over-the-top (that seemed like a decent basketball pun when I typed it out) with bars, line, and scatter plots. Player illustrations accent the piece, but do not convey information as data-encoded variables. I quibble with the rounded bar charts for the section on each team’s construction, but the section itself is fascinating. I might not know most of the metrics’ definitions, but I did not mind reading through the piece. Credit for the piece goes to Luke Knox and Cun Shi.